In Thai cooking, their curries come in two different types of bases, coconut based and water based. You would be surprised to find that the spiciest of the two is actually water based curries. The most typical water-based curry is sour curry (gaeng sohm plah) often prepared with fish. 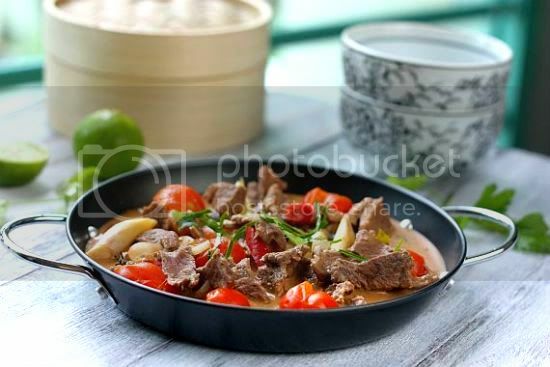 Thai coconut-based curries are numerous and the more well known curries are red, green, yellow, panang and masamam curries. I personally think most people would be more familiar with a Thai green curry dish as compared with a Red curry one. The flavours are quite different. If you are making the paste at home, you can reduce the number of chillies used to get a milder heat. If you like it hot, you can add a couple of bird's eye chillies as well. 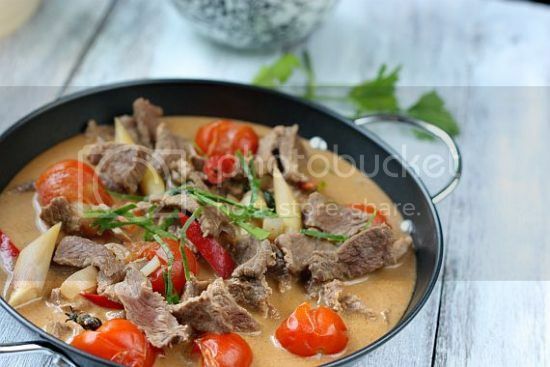 A variety of meats could be used to cook this curry such as pork, beef, chicken and even roasted duck, cut into bite size pieces. 2) Add in the shallots, lemongrass, lime leave and red chilli. Stir the fresh spices and then add in the beef. 3) Add in the water or stock and bring to a boil. Cook the curry for about 10 minutes on medium simmer. 4) Add the remaining coconut cream and the tomatoes. Bring to a boil. Season to taste with fish sauce and palm sugar. Cook for a further 4 - 5 minutes. Just before turning off the fire, throw in the coriander leaves and stir it into the curry. 5) Serve hot with steaming white rice. Pan fry the shrimp paste until fragrant. Toast the coriander and cumin seeds. Add all the ingredients in the food processor and grind until it becomes a fine paste. Store in the refrigerator. Will keep for about a week. I enjoy eating curries a lot and your version looks very very good...! My husband would especially go crazy over this :). I love curries especially Thai curries red or green is always my favorite. 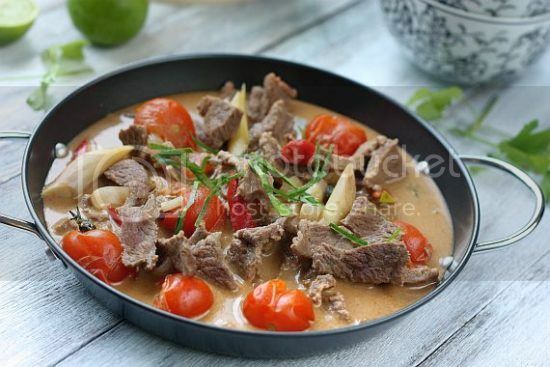 Love your beef curry too, I'm sure my family will love this very much I cook it for them. Looks so flavourful! I find water based curry more spicy too cause it doesn't have milk to tone down the spiciness! wow Those photos are just making my mouth water!!!! Hi Wiffy, haha I just use my living room window as my back-drop. I now take most of my photos in my hall. Hi Jo, thanks for sumbitting your lovely photo to DMBLGiT July 2011. Wishing you good luck !